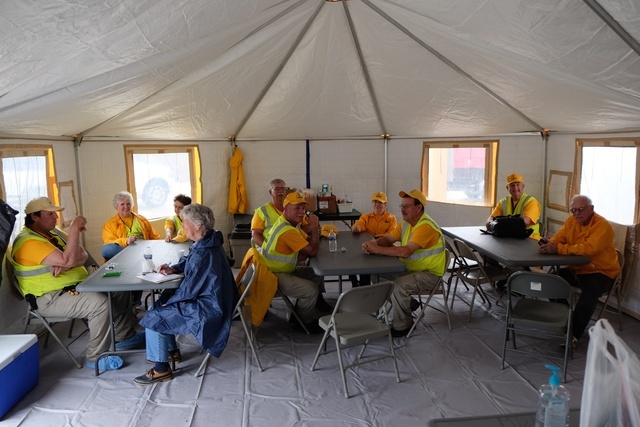 "Louisville, Miss., May 9, 2014 -- The North Carolina Baptist Men volunteers taking a brake in a tent set up as a break room. They have been setting up the mobile hospital on S. Church Street. Residents in Itawamba, Jones, Leake, Montgomery, Simpson, Warren, Lee, Lowdnes, Madison, Wayne, Rankin and Winston counties whose property was damaged by the recent storms, tornadoes and flooding in Mississippi may now apply for federal assistance, and are encouraged to apply, to FEMA by calling (800) 621-3362, (TTY) (800) 462-7585, or by applying online at www.DisasterAssistance.gov. FEMA/Bill Koplitz"